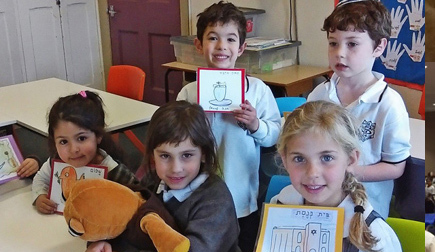 So many people ask me why we don’t just call our school “Adath Israel School” or “Adath Israel Hebrew School”. That’s a great question because it compels us to think of branding, of positioning, of pondering the purpose of continued investment in Adath Israel’s “in-house” education. Let me offer the following thoughts. We have survived for over a century because we have consistently recognized the changing needs of our congregants. The shul migrated along with its cogregants, from deep downtown on Centre Avenue to Bathurst and College and then to our present location. We followed our community’s parallel shift from Orthodoxy to Conservative Judaism. And we maintained a school and even purposefully built the Jacob Pascal School Wing to show how deeply our Congregation values Jewish education. But just as our Congregation has changed over time, so has the School’s focus. When I attended 3 times a week, many of the teachers were from Associated, and we prayed a good deal and actually learned quite a bit of Hebrew. The School had two shifts on Sunday and many of us were at Summit Height PS because 800 kids couldn’t fit into the School Wing. The School ran on Sundays through Thursday and no one could become Bar Mitzvah without attending the School up to and including the “big day”. These are no longer today’s realities. But rather than lament the past—I want to talk about one crucial constant in the school’s existence. That is the importance of teaching students how to be “synagogue literate”. That no longer means, as it did in my day, learning a large number of prayers in class and practicing them at Junior Congregation where attendance was taken and counted on your Adath Israel Congegational School report card!! (I still have mine to prove this!). What we now need to teach is what I call “foundational prayer”—a group of key prayers such as Shma, the beginning of the Amidah, Alenu, etc. that allow students to participate easily. To that end we are introducing a new way of teaching these prayers in our curriculum. The Early Years will focus on one group of prayers, Grades 2 and 3 will add new prayers to those already learned, and the upper grades will repeat the pattern. These prayers will be learned in class and during Music. In May there will be mini-concerts of each group followed by a school-wide concert featuring all the prayers we have learned. In that way the school has built the foundation for future participation. Next week, we will talk about what parents can do to further the school’s educational work.